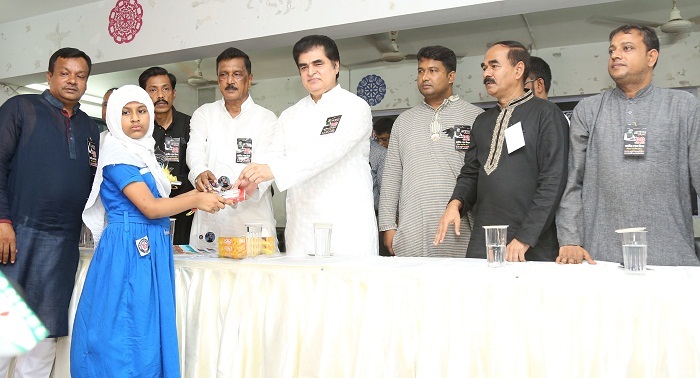 Banani Bidyaniketan School & College organised a milad-mahfil and discussion Session on the glorious life and contributions of Bangabandhu to observe the 43rd martyrdom anniversary of the Father of the Nation Bangabandhu Sheikh Mujibur Rahman and National Mourning Day 2018. Chairman of the Premier Bank Limited, Freedom Fighter and Ex Member of Parliament Dr. HBM Iqbal was present at the occasion as Chief Guest and distributed prizes to the winners of the drawing competition after the doa and milad mahfil. Mafijur Rahman, Chairman, Governing Body, Banani Bidyaniketan School & College and Commissioner; Principal of Banani Bidyaniketan School & College & Lt. Col. (Retd.) Mr. ABM Asaduzzaman, PSC & Principal of the Banani Bidyaniketan School & College & others distinguished guests were also present at the Doa & Milad Mahfil.